That wasn’t always the case. The turkey, squash, stuffing, and mashed potatoes that we ate every year at my grandparents’ played second fiddle to the dessert. Dessertime at those annual dinners was the closest I could get to doing in the kitchen, because I got to help set up the “dessert bar.” I call it a “bar” mainly because the table showcased such a variety of sweets. My grandmother used to order a couple of slices of many different pies from a local restaurant because we all had our loyalties—apple, pecan, pumpkin, chocolate cream, and, just one year, cherry. There were usually a decorated, nut-encrusted carrot layer cake and chocolate turkeys on sticks. My grandmother would make a pan of grape-nut pudding and a date-nut and/or pumpkin loaf. I’d bring something along, too—usually a cookie or a bar, since all of the other major bases were covered. My grandmother—in her rose-colored apron smattered with vegetables with faces, wearing chefs hats—would take care of the grown-up tasks (making the coffee and tea, moving pie slices from box to platter, and whipping cream) while I set the table and had the honor of carrying the sweets from kitchen, where the setting up took place, to dining room, parading them under the noses of my family members and asking if anyone wanted a slice of pecan or apple to be heated and topped with ice cream. So I guess I wasn’t really doing anything with the desserts themselves on those Thanksgivings, but I was near them. I could marvel at them before others could. We could speak our own language together, together in my grandmother’s kitchen. 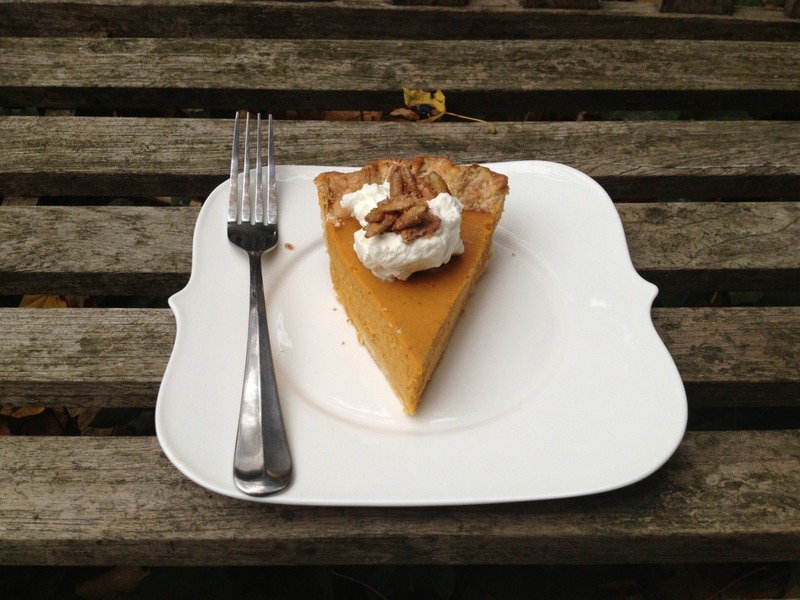 Every year, I went for the same slice that my grandmother chose, a slice of pumpkin pie, because its hue that matches that of the crispy fallen and disintegrating leaves, its creamy squash filling that reminds me of the texture of the Christmas puddings to come, and its gentle spice that warms the late-fall table made it seem like the right thing to eat. At my grandmothers’, the pie was always cold from the fridge, so I eat it that way today. 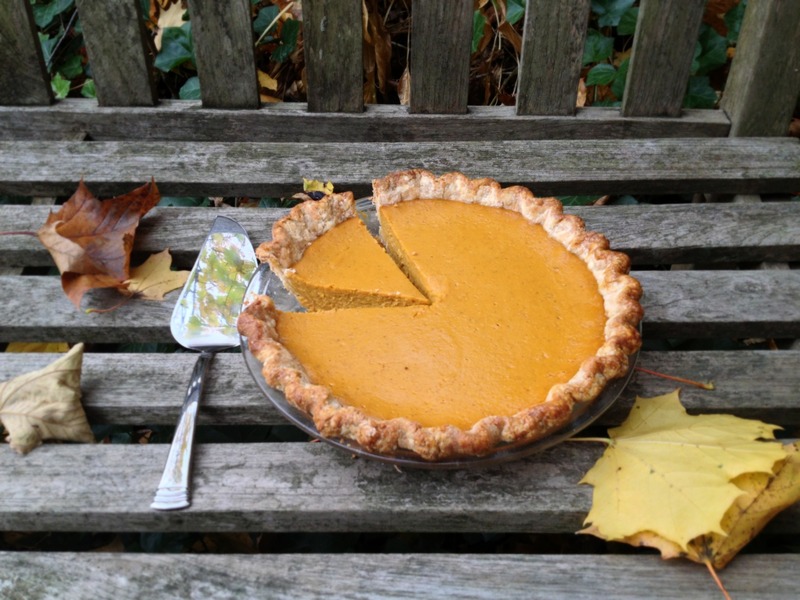 The crust on the pie of Thanksgivings past had a uniform texture and was most likely filled with hydrogenated scaries. 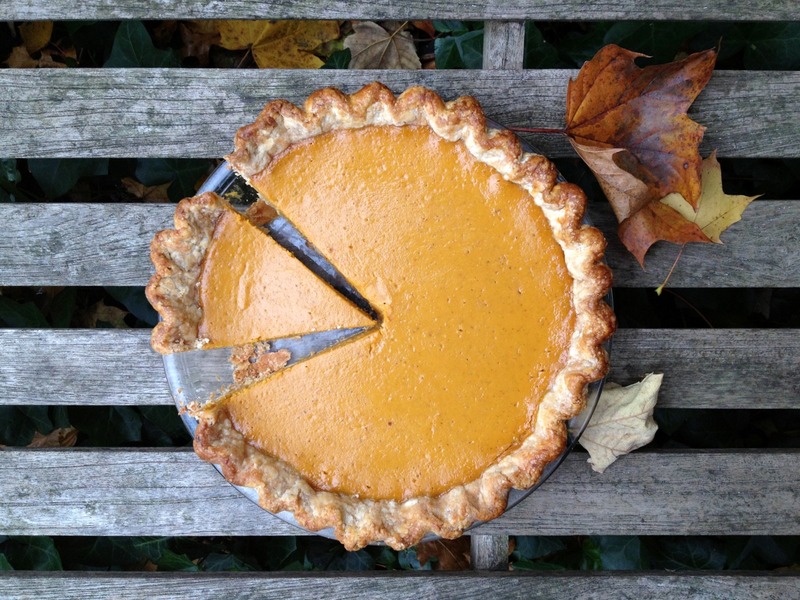 It was never flaky, and to this day, though I pass on the scaries, I don’t see the same buttery layers that I advocate in many posts as being a fitting choice for pumpkin. Moderate flakiness is the key here. Those formative moments in my dessert life have made it so that Thanksgiving cannot be Thanksgiving without a pumpkin pie. And without a perfect pumpkin pie. In making this, to my taste, perfect, pumpkin pie, I scrapped the recommended recipes from popular cookbooks and magazines and the ones on the back of supermarket cans and made what, for me, will be THE pumpkin pie recipe—the one that I will make now and always and for my children. The one that still makes me look forward to dessert, even if I’m craving the cruciferous funk of Brussels sprouts and the caramelized edges of roasted butternut squash the most. This pie, with its crunchy pepita topping isn’t wholly traditional, but it’s also not a huge departure from that restaurant-made pie that I enjoyed at many past Thanksgivings. With the pumpkin spice phenomenon, people think that pumpkins actually taste like cinnamon and nutmeg and not like, well, the flavorful and only faintly sweet gourd that they are. So I cut the spice in this pie—altogether. The pie gets its spice from 2 teaspoons of fresh grated ginger, which provide that much-loved warmth along with a freshness that one cannot get from a glut of dusty spices. A shot of bourbon provides vanilla notes and depth but doesn’t make this taste like a “bourbon pumpkin pie” (which is good but different). 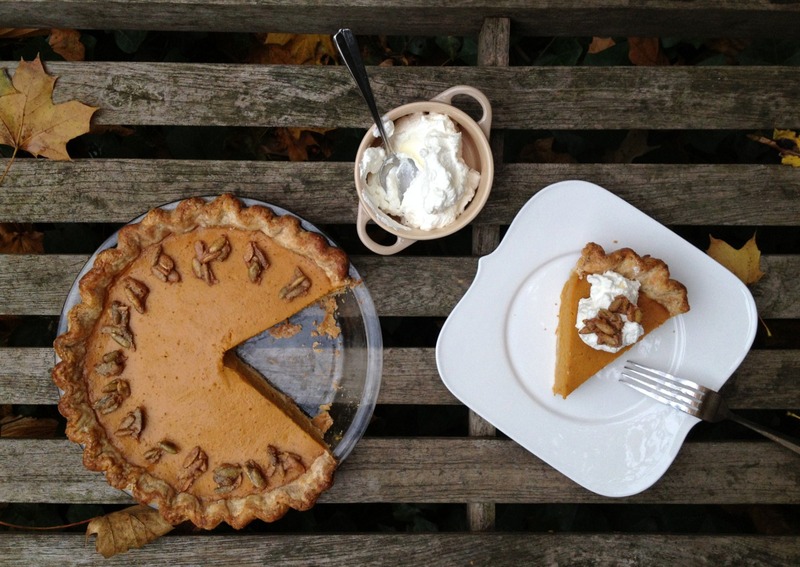 But what really makes this pie better than any other pumpkin pie that I’ve had is the nutty richness provided by what must be, if you follow along here, my favorite ingredient: browned butter. The overcooked butter doesn’t mask the pumpkin flavor but toasts and roasts it, making it irresistible, And the pumpkin purée is cooked down to a paste so that its flavor concentrates to the nth degree. To hold that smooth and creamy but not-too-custard-y rich pumpkin filling is a pie dough that employs a heck of a lot of cream cheese. This crust, as a result, lacks the impossible amount of flaky layers that my traditional pâte brisée or rye dough has, but it doesn’t need them. Instead, this crust contributes a pleasant but noticeable tang that offsets the richness of the browned butter–pumpkin filling. Plus, it’s super-tender. Yes, pie-making on Thanksgiving is, to me, the most meaningful way of doing that can be, well, done. I will be hosting my first Thanksgiving outside of a relative’s home this year. And while my three-person urban Thanksgiving will deviate from the norm in many ways, it will not be without a slice of this pie. Make sure to push the limits of darkness when browning the butter for the nuttiest flavor in the final pie. Do not strain the milk solids before using. The bourbon adds a beautiful warm, round note—not a boozy one—to the pie. If you choose to bake without it, replace it with 1 teaspoon of vanilla extract. 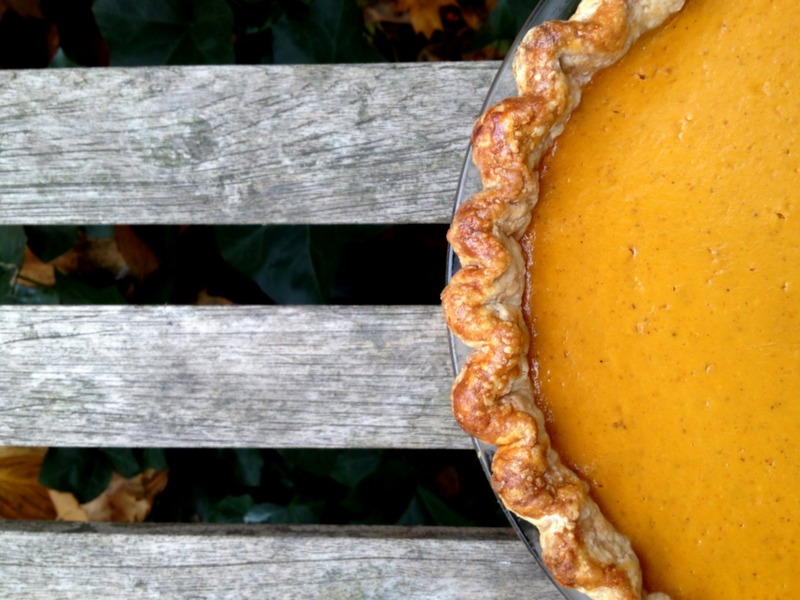 The best way to accurately determine if the pie is done is with an instant read thermometer. 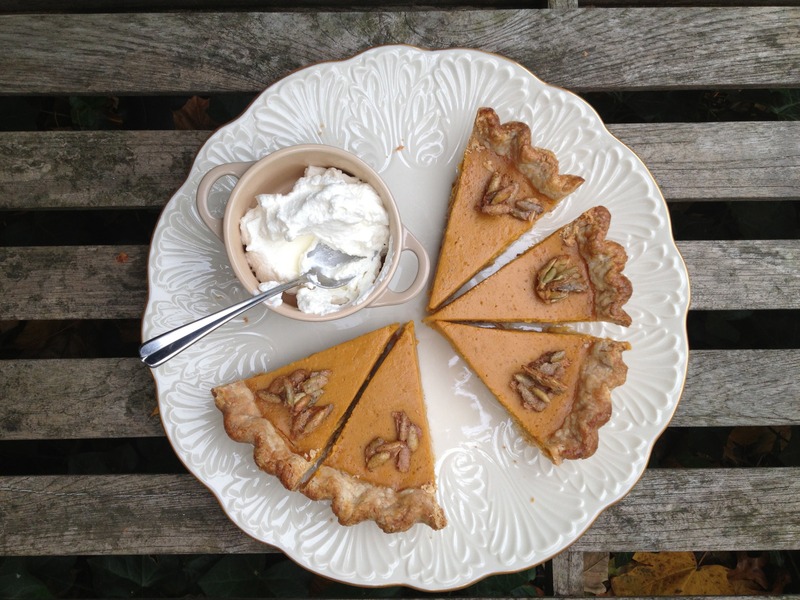 I like to serve this pie with whipped cream and candied pepitas (recipe follows). Pepitas are shelled pumpkin seeds. 1. Adjust oven rack to middle rack and heat oven to 400 degrees. Roll dough into 1/8-inch-thick circle measuring 12 to 13 inches in diameter. Transfer to 9-inch pie plate and crimp as desired. Freeze pie shell for 30 minutes. Line frozen pie shell with parchment paper or aluminum foil, covering edges with paper or foil. Fill shell with pie weights and bake until set, 15 to 20 minutes. Remove paper and weights, rotate pie plate, and bake until dough is dry and lightly golden, 7 to 10 minutes longer. Set crust aside. 2. Combine pumpkin purée, brown sugar, granulated sugar, ginger, and salt in large saucepan. Simmer mixture over medium heat, stirring occasionally and scraping the bottom of the saucepan with a rubber spatula, until pumpkin mixture is dark, thickened, and paste-like, 10-12 minutes (mixture should measure 11/2 cups). 3. Meanwhile, melt butter in small, light-colored skillet over medium-low heat. Once melted, continue to cook, stirring occasionally with rubber spatula, until milk solids have turned dark brown, liquid has turned golden, and butter smells of toasted hazelnuts, 7-10 minutes (stir constantly during last 3 minutes). Set aside. 4. Transfer pumpkin mixture to bowl of food processor, add bourbon and browned butter, and process until mixture is completely smooth and slightly more cool, about 30 seconds. Add milk and cornstarch to pumpkin mixture and process until incorporated. Add eggs and process until combined, about 15 seconds (don’t overmix). 5. Meanwhile, brush pie crust bottom, sides, and rim with beaten egg. Return pie shell to oven for 2 to 3 minutes to reheat. Pour pumpkin mixture into crust and smooth top. Bake pie for 5 minutes, then reduce oven temperature to 325 degrees and bake pie until the edges are set, center jiggles just slightly, and center registers 170 to 175 degrees, 30 to 45 minutes. Transfer pie to wire rack and let cool completely, 2 to 3 hours, before slicing or refrigerating. 1. Pulse flour, sugar, and salt in food processor until combined, about 5 pulses. Scatter frozen cubes of butter and cream cheese, and pulse until mixture resembles coarse crumbs with some larger pieces remaining. Combine water and vinegar in small bowl and pulse into dough mixture until just combined. 2. Dump dough mixture onto sheet of plastic wrap, form into disk, and refrigerate for at least 1 hour or up to 2 days before rolling. I have never had or thought about making pumpkin pie – it’s just not something we make in the UK – and I always imagined it to be sickly sweet. This sounds like a fresh, grown-up version and looks absolutely delicious… maybe I will give it a try! This is one beautiful pie! Gorgeous photos, too! i’m totally in love with my mom’s pumpkin chiffon, i can never really eat another regular pumpkin pie :) although, browned butter does sound awefully enticing! I have never much liked pumpkin pie, which is strange because I love winter squashes of all sorts and sweet potatoes and the like. I think that it may be my general dislike of what my husband derisively calls “Christmas spices.” As you have dispensed with them and left only the best (fresh ginger, yes! ), I must reconsider and give this one a try. Lovely post, as always.